KSB Australia announces the availability of a new range of mag drive pumps for process engineering applications. KSB Aktiengesellschaft, Frankenthal launched the latest generation of its Magnochem mag drive pumps in April 2014. Available in 52 sizes, the new series is primarily characterised by high outputs per size ensuring extremely low energy consumption. All pump characteristics conform to the ISO 2858/EN 22 858/ISO 5199 standards. Particular attention has been paid to the design of the magnetic coupling and the routing of circulation, cooling and lubricating flows to allow the operator to choose between four operating modes ranging from simple internal circulation to a dead-end configuration with an auxiliary hydraulic system. An external heat exchanger can be optionally installed allowing the pump set to be optimised for the pumping of polymerising, coagulating and crystallising as well as low-boiling fluids. The containment shrouds are available in metals such as Hastelloy or Titanium and can also be made of zirconium oxide depending on customer requirements. The latter is extremely resistant to corrosion and does not produce eddy currents when a magnetic field passes through it, eliminating the possibility of unnecessary heat losses, which would otherwise reduce output and compromise pump efficiency. Samarium-cobalt has been selected as a material for the magnets as it is highly temperature-resistant and has excellent magnetic characteristics. Diamond-coated plain bearings ensure effective anti-seizure properties in the event of insufficient lubrication; when combined with an optimised arrangement of the radial plain bearings, this feature is particularly beneficial in ensuring the pump’s operating reliability. 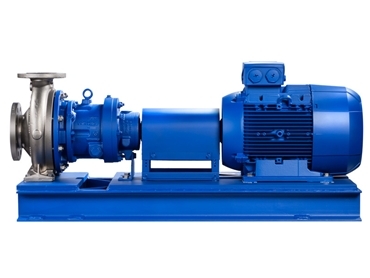 Key features of KSB Magnochem mag drive pumps include multiple coupling dimensions available for each pump size, avoiding the need for oversized magnetic drives; very low vibration levels during operation as each pump rotor is subjected to static and dynamic balancing during manufacturing; optional leakage barriers such as shaft seal rings at the motor end for additional level of reliability; choice of conventional back pull-out version and close-coupled variant to be available in 44 sizes for installation in confined spaces; and flow rates up to 1,400 m³/h at a maximum head of 233m. Permissible operating temperatures range from -90°C to +300°C.